Here are some new questions from the student reporters of Wycombe Abbey International School in Changzhou – I thought that they were so interesting, I’d publish them here so you can all see the answers! I started writing when I was about 7 years old! I fell in love with the funny books of Dr Seuss, and decided that I wanted to write poems and stories just like him! So I started out with a story about a girl called Penny, and her dog called Eric who goes missing. Then some poems. And then I just couldn’t stop writing poems about everything – mainly for family birthdays, and for Father Christmas, and about funny things that happened in my life. 2. Where do you get your ideas for your writing? For my Chinese Calendar Tales, it’s easy as I know what Zodiac animal I have to write about, and I base their characters on the Zodiac characteristics for that particular animal. And then from my research of Chinese history, I find the true historical character or the Chinese folk tale that will be woven into the story. But for other writing, quite honestly, the ideas simply pop into my head unexpectedly! It might be when I have a memory, or hear a conversation, or read something in the news, or in a book I’m reading. My story Storm Whale, for example, just popped into my head one day when I was reading the news about some whales which had been stranded on a beach in America, which took me back to my experiences finding stranded whales when I was a kid on holiday in Tasmania. It really depends on the book! I am a big story planner, and before I’ve even written the story, I’ve worked out what’s happening on every page. So when I start to write the story, sometimes it’s really very fast to write because I’ve planned the story and it’s already in my head, and my subconscious has been working on it without me knowing. So then it might take me just a day or two to write the first draft, and a day or two to finish editing – this is what happened with The Tale of Run Run Rat. Other times, for example with this year’s The Tale of Desmond Dog, it took ages to get it just right – I counted 18 edits before I was happy, and it took me about three weeks to write! 4. Do you have a special place where you write? Because I’m a publisher as well as a writer, I spend a lot of time working at my desk at home, and in my office, doing the business side of my job. So when I write my stories, I need to get away from my everyday life! I tend to write my next Calendar Tale while we are on holidays over the summer – mostly that’s in the French countryside. And I like to get out into the garden or under a tree, which I really believe helps me to get in touch with my imagination! 5. How long did it take for you to get your books published? My first two books were A Dirty Story and An Even Dirtier Story, and these were published by an independent publisher here in Hong Kong. I knew the publisher beforehand, as he had been publishing some funny columns I’d been writing for mums and dads in a parenting magazine. He approached me to find out if I had written any kids books, and he loved the manuscript for A Dirty Story, which was published within the next 8 months. Then we did the second story, An Even Dirtier Story, 12 months later. So I was very lucky. After that I set up my own publishing company Auspicious Times Limited, so I’m the one who decides about publishing my own stories! So from start to finish (writing the story in the summer and printing in the autumn every year) the publishing process only takes 3 to 4 months. 6. Have you ever had a book rejected? How did you feel? I actually submitted the manuscript for A Dirty Story to a publisher in the UK about ten years before I came to Hong Kong, and the publisher I wrote to was really rude about it when they said “no”, which made me feel both angry and sad! But all the articles about getting your books rejected say that you should not take it personally – often it’s just about the particular style of the publishing house, or what other books they’ve published in recent years. So the important thing is to believe in your own work, and keep on sending it out to publishers! The later success of A Dirty Story, here in Hong Kong, made me feel much better! 7. 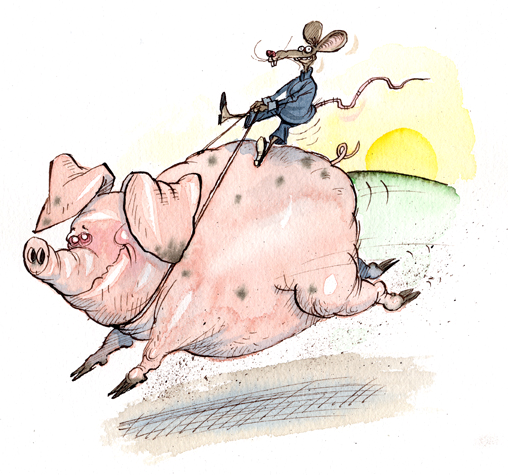 Do you work closely with the illustrators of your books or do you leave that to your editor? Well, with the books I published myself (all the Chinese Calendar Tales) I’m the person who is in contact with the illustrator. But I’m a strong believer that if you leave the illustrating decisions to the artist, and only interfere if there’s an actual mistake, then you end up with two creative minds delivering the story, which is much better than one mind alone! When you allow the illustrator to do what he or she wants, I truly believe you get the equation of 1 + 1 = 3! With Storm Whale, both I and the publishers, Allen and Unwin, left the artist Jane Tanner completely alone to do her own interpretation, and this I believe is why it is such an exquisite book which has received wonderful reviews and three award nominations this year to date in the UK and Australia! 8. How much travelling do you do to promote your books? A lot – about a half of my working year including local visits in Hong Kong! These days, any author who wants to be successful has to travel a lot too! 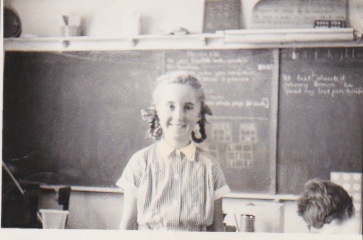 The old days of the children’s author as a shy wilting violet who hates to talk about him or herself and hides behind his or her book are, sadly in many ways, over, and the only way to ensure that your books sell a lot is to get out and visit lots of schools and bookshops, as far and wide as possible! It just so happens that I LOVE travel and meeting new people, and talking my head off, so I’m the ideal candidate for this sort of frenetic lifestyle. Though I have to admit that being a mum with a beloved daughter still at home doing her final year, and having a husband and dog I love very much and need to spend time with, does impose limits! 9. What is the best part of being a writer? Oh – everything! But if I had to pick, it’s the writing itself, which makes me feel extremely happy and satisfied when it goes right (and frustrated when I struggle to get it right! ), visiting schools and meeting other authors. My three greatest loves (apart from my family) are writing, books and spending time with kids, so I always feel like I’m the luckiest person in the world with this job! 10. Is there anything else you would like to tell us about your books and your writing? One of the other amazing things about being a writer is that you never have to retire! I plan to keep writing (and visiting schools) for as long as I can, even if I have a walking stick, very grey hair, and a hearing aid!! My series The Chinese Calendar Tales ends with my story about the Pig which I’m writing this summer – it makes me feel rather sad, as it’s the end of a 13 year era, but I have huge plans for what happens afterwards! I’m planning to write more one-off, lyrical picture books like Storm Whale, and a series about Australian animals. I’m also very keen to keep writing about Chinese history for kids, and to write a biography about my both my grandfathers, one Anglo-Irish, one Australian, who had extraordinary lives – so watch this space! I’ve just had a lovely time reading some fantastic letters sent to me by the students of Class 3E at Yew Chung International School, Puxi! The letters were so well-written and neat, and some had really wonderful pictures too! But they also asked lots and lots of questions which I thought my blog-readers might like to know the answers too as well! So here are the answers and some really fun photos – enjoy! Thank you for your lovely letters! I thought that your letters were beautifully written. The handwriting was MUCH better than mine, and I thought the way you set out your letters on the page was really neat and impressive! There were also some really brilliant pictures too! I hope you don’t mind me writing to you as a group. But you’ve all asked me lots of questions, and some of them were the same or very similar to other kids in your class, so I thought that I would answer all of them in one go, so that you can all read the answers to all the questions! Q1: How many books have you written altogether? I have written 11 books altogether, including eight Chinese Calendar Tales, two Dirty Stories, and one funny book for mums called Dummies for Mummies! I’ve also just written my story for the Year of the Ram next year, but that’s a top secret one and I can’t even tell you the name yet! Q2: What do you want to write next? I’ve just written my story for next Year of the Ram (or Sheep or Goat), so the next story will be about the Monkey for 2016! Q3: Are you going to write about the Horse this year? Yes! 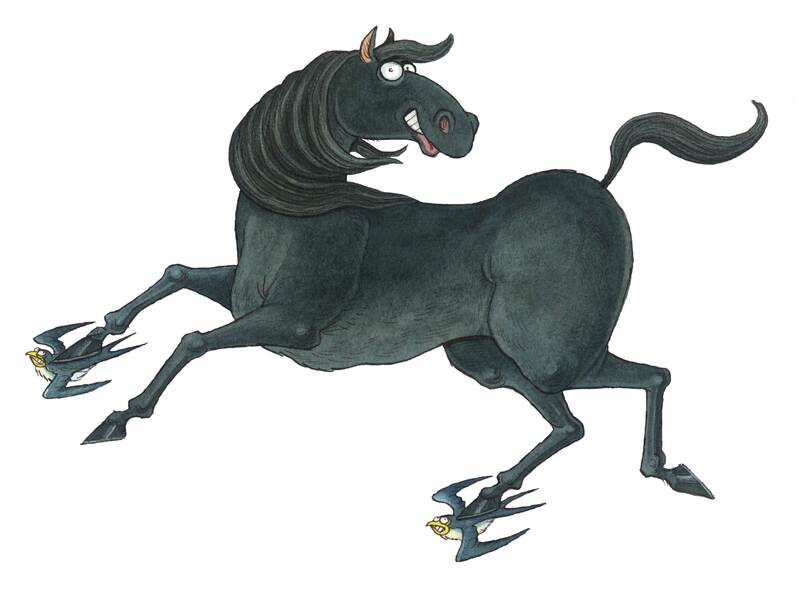 I’ve written a story called The Tale of a Dark Horse, and I’ll be reading that to you all when I come in March! Here is a picture of him! Q4: Why did you choose to write about the Chinese Zodiac animals? I was visiting schools in Hong Kong with my first two published books, A Dirty Story and An Even Dirtier Story, but I felt a bit guilty because most of the kids I was reading to were Chinese or of Asian heritage, while the books were very European. So I decided to write a book for these kids about their own heritage. I wrote The Tale of Chester Choi, about a Chinese dragon who ate children by the side of the South China Sea, which the kids just loved, so then I wrote The Tale of Run Run Rat (since the next year was the Year of the Rat), and that became Hong Kong’s No. 1 kids best-seller ahead of Harry Potter for 6 whole weeks! So then I decided that I would write one book each year about that year’s Chinese zodiac animal! Q5: Are you going to write a story about a dog? Yes! The Year of the Dog isn’t until 2018 so I guess I’ll write that story towards the end of 2017! I already have some great ideas for it, but they are top secret I’m afraid! Q6: Which is your favourite book which you wrote and why? Kids ALWAYS ask me this question and I always give the same answer! When you write books, those books become your children! And you NEVER ask a mother which of her children is her favourite!! I am usually most protective towards the “baby” in the family, which this year is my new Tale of a Dark Horse. But I do love them all equally, for different reasons! Q7: What will you read for Book Week? I’ll be reading my latest story, The Tale of a Dark Horse! It’s a really exciting story, though a bit sad as well, and it has some FANTASTIC Chinese history in it, which I am sure you will find as fascinating as I did when I read about it! Q8: Where did you get the idea for A Dirty Story? When I was at university I used to babysit for a family of 8 children! They were very messy and I used to tease them, calling them the Little Grots! 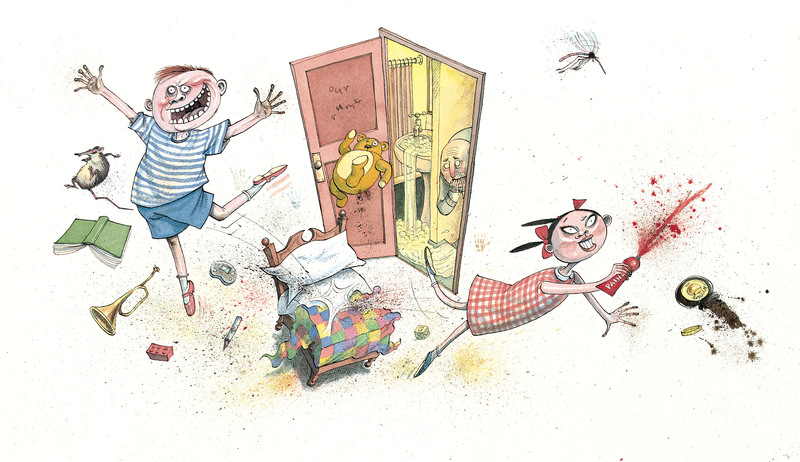 So when I later decided to write a funny story for kids about being neat and clean, of course I remembered the Little Grots, and how very messy they were. Q1: Why did you choose to be a lawyer before you became an author? I actually always wanted to be a writer, but my mum and dad, being wise people, said to me “Make sure you do a degree at university so you have something sensible to fall back on!” Because I loved debating and words, I chose a law degree, and then I thought I’d better get some work experience, and one thing led to another, and before I knew it I’d been a lawyer for almost 20 years and was a partner in a law firm in London! It was only when I came to Hong Kong with my husband that I stopped working as a lawyer and started writing again. Q2: Why did you want to become an author? I wanted to be an author because I LOVED playing with words, and I LOVED reading books, and I’d been writing poems and stories since I was 7 years old. I always wanted to write my own books, but until I came to Hong Kong it was all a bit of a “pipe dream”. I also love working with kids, which is why I just LOVE being a children’s author! Q3: Do you still write books? Yes of course! I’ve just written the story for next Year of the Ram, and I still need to write stories for all the remaining Zodiac animals! And that’s just a start! I hope I can keep writing until I’m a very old lady! Q4: Why do you like writing books? I like writing books for lots of reasons, which can be summed up by saying it’s huge FUN! I love playing with words, and writing in rhyme, because it’s a lot of fun and a great challenge to make things rhyme so it seems natural. I also love dreaming up my characters! Once I work out what they are like, they start coming “alive” for me and it’s great fun to give them things to do and adventures to go on. I also love working with kids, and when I introduce them to my books and my characters it’s like sharing old friends! Q5: How did you become an author? 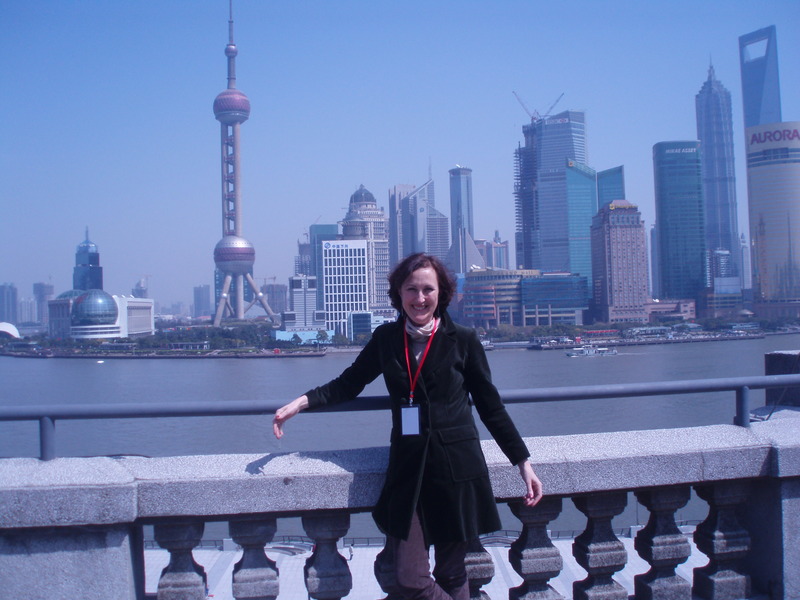 I became an author when, after almost 20 years of being a lawyer, I moved with my husband to Hong Kong. When my second daughter started going to pre-school, I was asked by the head teacher if I would write for their in-house magazine. I wrote a funny column, and then the publisher of a parenting magazine asked if I would be their lead feature writer for the year. Then the publisher asked me and my husband to a Burns’ Night Supper on condition that we each brought a poem to read. I thought he meant write a poem so I wrote one about a “Feral Bagpipe” which roamed the Scottish hills searching for a home. The publisher liked my poem so much, he came knocking on my door the next day to ask if I had written any stories for children. I had a big pink plastic bag-full, dating back to my childhood! 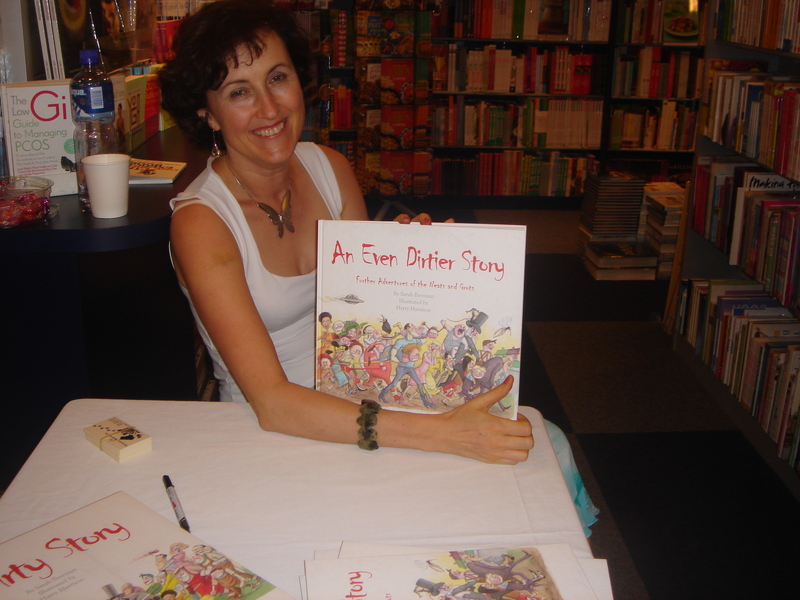 So I showed him “A Dirty Story” and he took it to Harry Harrison who did some amazing illustrations, and my first children’s book was born in 2004, and “An Even Dirtier Story” in 2005! Q6: What is it like being an author? It’s great fun, but a bit of a roller coaster ride sometimes! I’m always very busy and have to do a lot of work travelling and visiting schools and bookstores in different countries. Sometimes it can get a bit lonely in hotels at night, but then I Skype my family, and as soon as I’m with a whole lot of kids the next day I’m happy again! I love the writing, and I love the school visits, but I don’t like the business side of things some times, especially filling in forms and doing tax returns! Q7: Where do you get your ideas from? I grew up in the Tasmanian bush, with lots of different animals, so I get ideas from the animals I knew in my childhood. 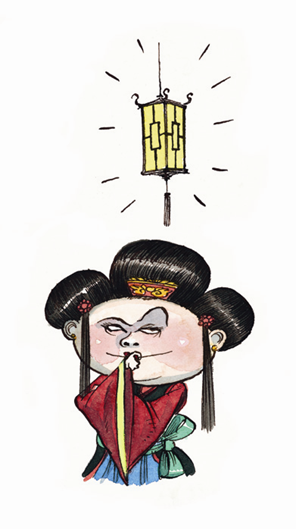 I also get lots of ideas from researching Chinese history and folklore. And sometimes I even get ideas from dreams! Q8: Do you like writing chapter books or short books? 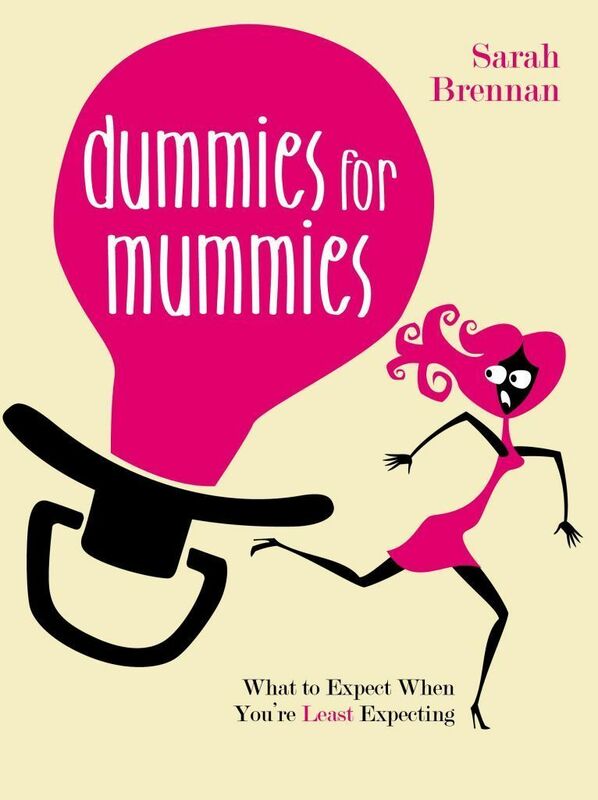 I’ve only ever written one chapter book, which is my funny parenting book for mums and dads called Dummies for Mummies. I’d love to write a chapter book for kids one day, but I’m a bit busy at the moment with my Chinese Calendar Tales! Q9: Why do you like writing books about the Chinese zodiac? I like writing books about the Chinese zodiac because I love animals, and I also think Chinese history is just amazing! So I can combine both of these favourite things at the same time by writing about the Chinese zodiac! 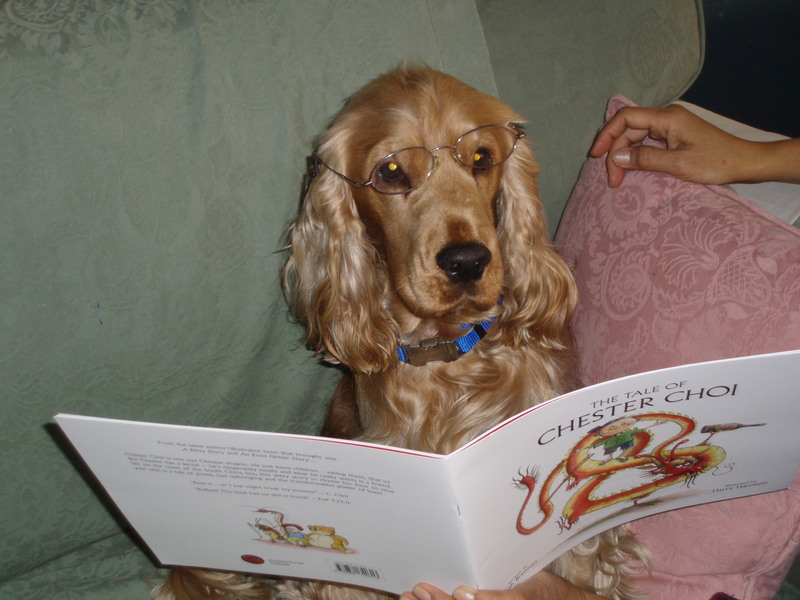 Q10: Can you write a dog story? Have patience my friends! I will write a story for the Year of the Dog in 2018 – but you’ll have to wait till then! Q11: Do you have a place you like to write? I like writing my stories where I feel relaxed and away from the daily grind. So sometimes that’s when I’m away on holidays – The Tale of Sybil Snake for example was written on holidays in the French countryside, underneath a beautiful old willow tree – and sometimes that’s when I’m relaxing in the countryside in Hong Kong – like The Tale of Oswald Ox which was written in Hong Kong on Middle Island, sitting in the sun while my girls were learning how to sail dinghies one summer. 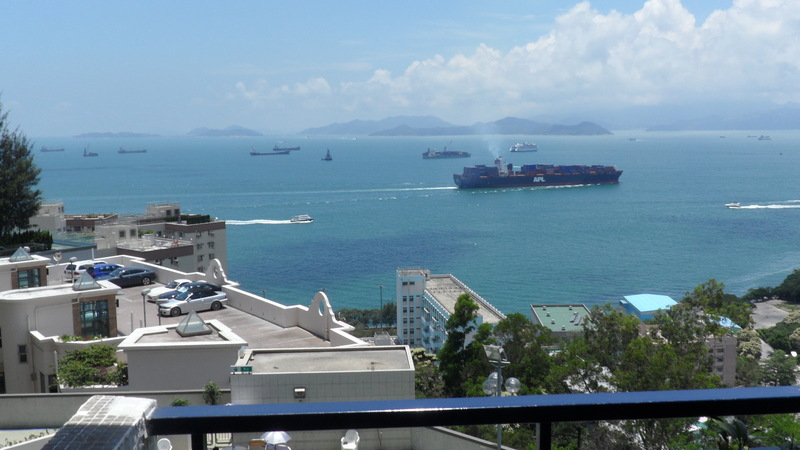 Then at other times, it’s when I’m sitting on my old comfy sofa in my house, with Bobby at my feet, watching all the ships glide by on Victoria Harbour outside our balcony window. Now that is a question I get asked all the time, so I’m going to say what I always answer: I’m as old as my tongue, and a little bit older than my teeth! Q2: When were you born? Now that’s just a sneaky way of finding out how old I am! So I’m just going to say that I was born on my birthday! Q3: Which Zodiac animal are you? I am a Rat, which makes me just like Run Run Rat! I’m ambitious, on the go all the time and easily bored so I have to keep extremely busy to stay happy! Q4: How many children do you have? 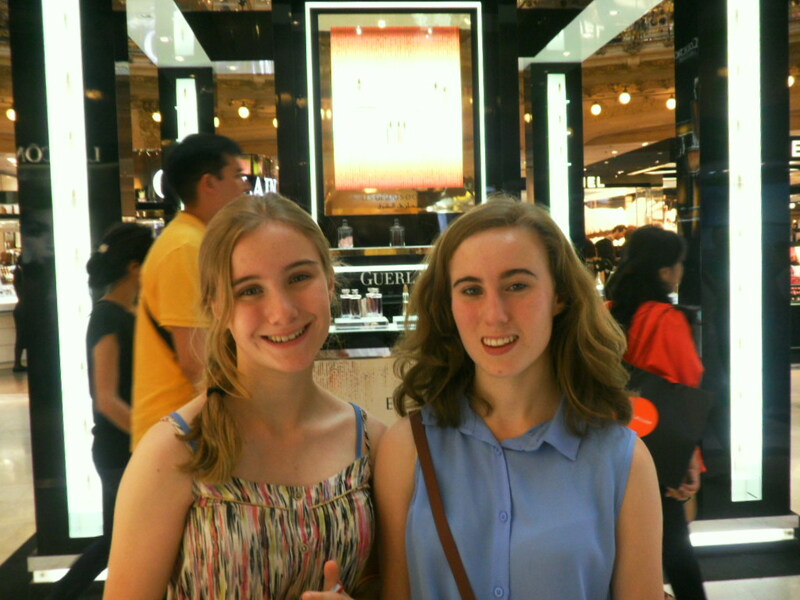 I have two daughters named Beatrice and Annabel who are 16 and 13 years old respectively. Annabel is on the left and Bea on the right! Q5: How long have you been an author? I’ve been a published author since A Dirty Story was published in 2004, ten years ago! Q6: What was it like when you were a child? I grew up in Hobart, in Tasmania, the island state in Australia, and we had a wonderful Alpine style house on the slopes of Mt Wellington, surrounded by a beautiful garden created by my parents, which itself was surrounded by bush land. We had all sorts of animals including goats and exotic birds, and there were also many wild animals including bandicoots, Tasmanian devils and even a platypus in the creek! 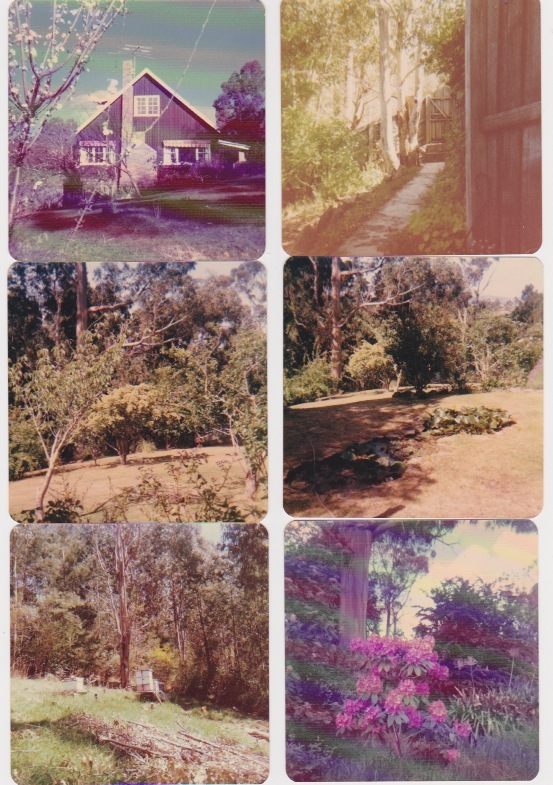 I went to a Quaker School called The Friends’ School in North Hobart, but spent most of my spare time at home playing in the garden or staring into the creek or writing poems or collecting blackberries, mushrooms, pears and apples in a wild abandoned garden just near our house. I even played the bagpipes! Every day I had to do chores like feeding the animals or helping my mum with the cleaning, or caring for the vegetable garden, or hanging out the washing, or helping my Dad to carry logs of wood from the valley for firewood in the winter. 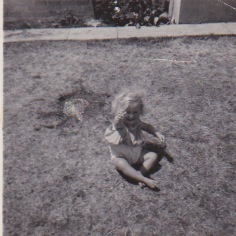 It was a fantastic childhood, and I’m very grateful to my mum and dad for giving me such a magical start in life. Q7: Is your platypus real? Hmmm…. I think you must be referring to the platypus in our creek when I was growing up in Tasmania! Of course it was real – but I was the only person in our family ever to see it, so they always talked about “Sarah’s platypus” with a funny expression which meant they thought I might be making it all up! But it was a real platypus, which surfaced on the water one day when I was lying by the creek watching it flow by, looked at me out of its black beady eyes, then flipped around and disappeared in a flash under the water, showing its tail and its furry body and its strong little back legs. I was so excited I could hardly breathe! Q8: How long have you been writing? Since I was 7 years old, when I fell in love with Dr Seuss’s The Cat in the Hat and decided that I wanted to be a writer just like him! Q9: Are you scared of injections? I’m not really scared of them, but I don’t like them much either! I find the best thing to do is to watch the injection happening so I don’t get a nasty surprise – I like being prepared! 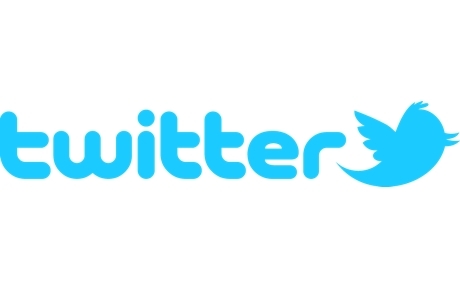 Q10: Where are you now? Right now, I’m sitting on my sofa in my lounge room in my apartment in Pok Fu Lam in Hong Kong. 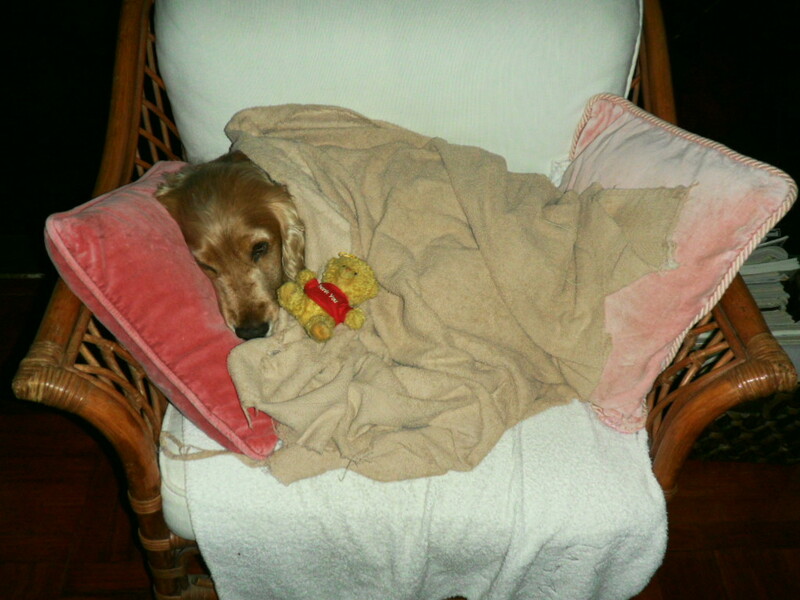 Bobby our dog is fast asleep on the armchair opposite me, which is his special armchair, and he’s all rugged up in a cosy warm towel to keep him warm, because it’s chilly outside! He also has his favourite teddy to keep him company! Q11: What do you do in your spare time? I love reading books, going for walks with Bobby, cooking yummy dinners for my family and friends, watching good movies on TV or in the cinema and playing Scrabble and Monopoly or card games with my husband and the girls! I also love knitting because it’s very restful and I need to relax sometimes. And sometimes I play the piano (not very well) and draw and paint (not very well either but it’s fun!). Q12: Where is your pink plastic bag now? It’s sitting in my filing cabinet at work, still holding lots of old poems and stories! One day I will go through them to see if I can make any of them into books, but at the moment I’m just too busy! QUESTIONS ABOUT MY DOG BOBBY! 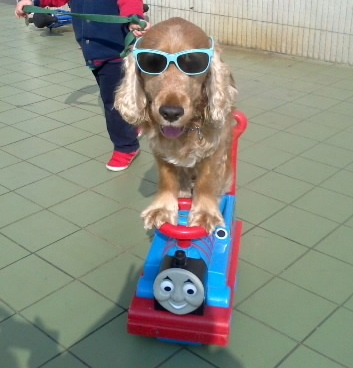 Q1: Do you have any pets in Hong Kong? Yes I do, and here he is! His name is Bobby, and he’s a 7-year-old golden cocker spaniel. 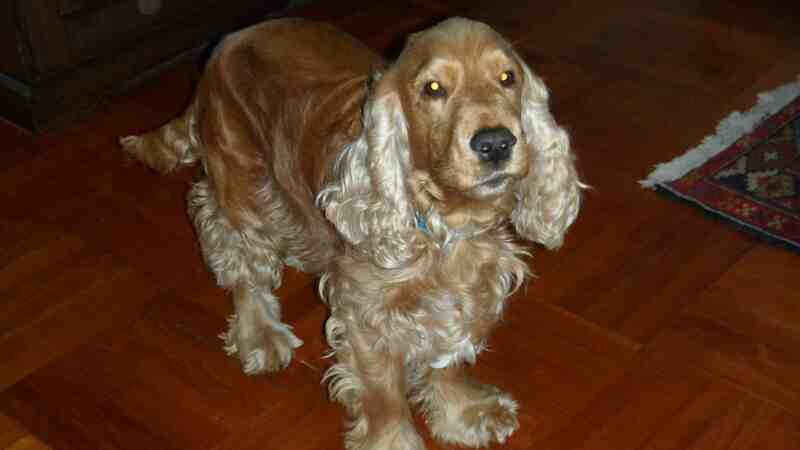 He is very funny and affectionate and sweet, and we all love him dearly. 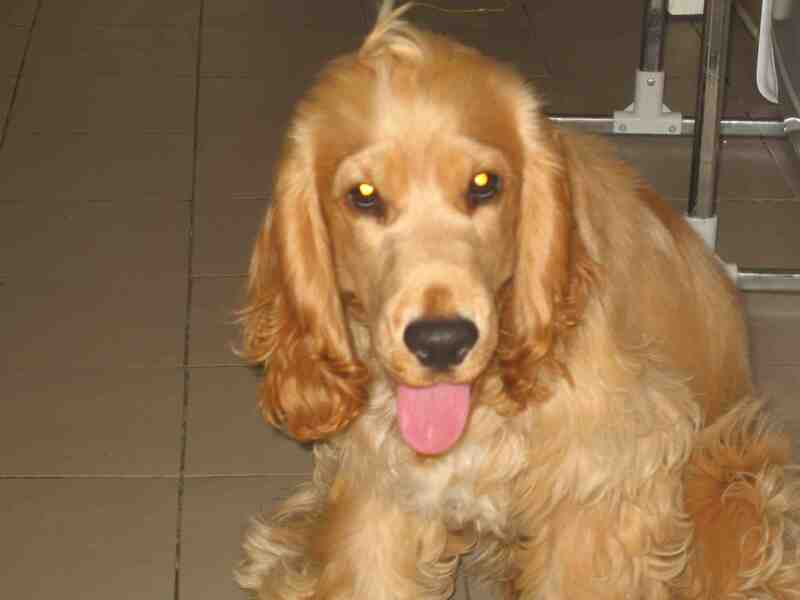 He also speaks five languages: Chinese, Tagalog (a Philippines language with our helper or maid), English, French (with my husband) and …you guessed it…DOG language! 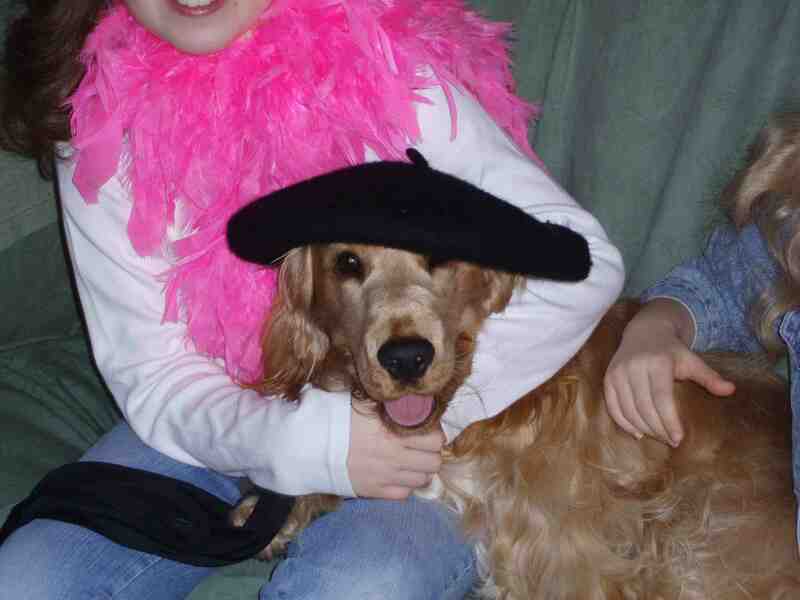 Here he is, speaking French! Q2: Does Bobby read books? 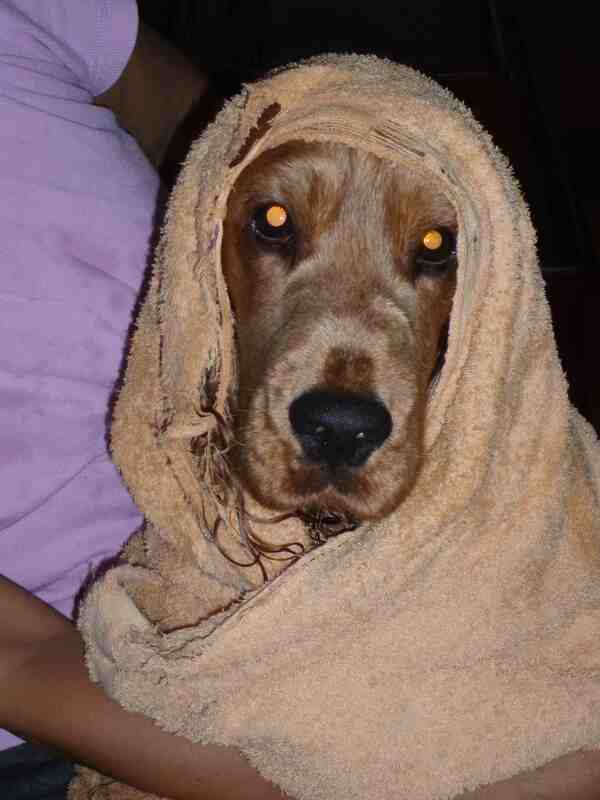 And he HATES getting his hair washed! Q3: Why did you name your dog Bobby? Q4: Why does Bobby wear glasses? To read books of course! I am aman from year 5 at peak school who I said that my mother says you are awsome. Now the point is how do we enter the competition . Dear Aman, thank you for your post! You can enter the competition by clicking on the Clever Competition page on the header above where you will find all the information you need! I can’t wait to read your entry! And please say hello to your awesome mum from me! Thank’s for going to YKPao school, and reading to us! Thanks so much Ben – I loved visiting your school and would love to come again some time! I think you didn’t see my post on the clever competitions blog. Do you remember me and my entry was sent early, remember? I haven’t been lately hearing that you’re coming to SJS because I really want to read the tale of a dark dark horse! Please contact me if you’re coming to SJS, or, if you’re doing a book launch, I’d be happy to come along if it’s in HK! Hello Hillary – I’ll be at SJS next week on Wednesday 30th April – see you then! Hi Sarah I’m Alnur Abuov from 4G in Harrow School. The boy with the brown hair with blue glasses I’m one of the people who wanted to write an Acrostic poem about you! Bye! Hi Alnur, it’s great to hear from you and I remember you well! If you write a NICE acrostic about me I’ll publish it on my blog! Could you start a story writing competition as well as a poem writing competition? Winter if you read the details on the Clever Competition page you will find that the latest competition IS a story competition, not a poetry competition! You just need to click on the tab for the Clever Competitions page which is at the top of the blog homepage! I look forward to your entry! Why do you wanted to become an author when you were young? Hello Shirley – I wanted to become an author because I loved words and reading and I also loved the idea of playing with words – just like Dr Seuss! Thanks for comig to DGJS yesterday. I loved your talk and I can’t wait to read another of your anapestic books! Wow Andrea – now that IS a big word! I had to look it up – and there’s not too many words I have to look up these days – so well done! I do hope to see you enter my writing competitions in the future! What is your dog’s favourite toy? Hi Nathania – Bobby’s favourite toy at the moment is a blue and black spotted stuffed snake!! He tends to chew his toys, so they don’t last long and we have to keep replacing them on his birthday! I don’t really get how Bobby speaks so many languages!